The year 2016 was as challenging as 2015. The introduction of the GST two years ago ushered in a number of uncertainties, as consumers reined in their spending power and advertisers were compelled to innovate to push their products and services. The Council sought to nurture Members and equip Members with the right tools to face not only these new realities but also to harvest the potential of digital media to reach an increasingly mobile consumer base. These efforts entailed a number of collaborations with industry bodies that allowed Members to understand and appreciate the importance of digital platforms and strategies. The Council introduced three new portfolios to aid the delivery of Association goals. 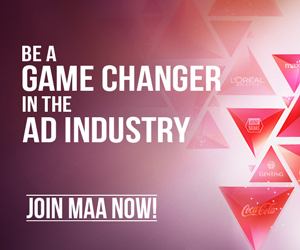 The Website, Media and Publicity plus Awards and Conference groups were created to supplement the main portfolios that support the Four Pillars of the Association. Our membership now stands at 114. 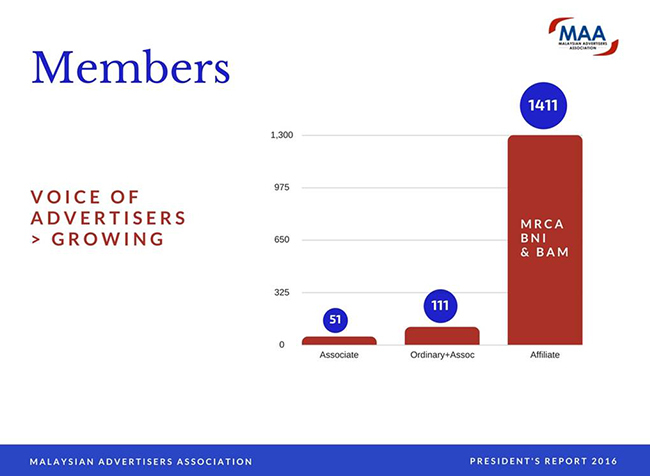 The Council is aware that more Members joined under the Associate Category and, as such, the membership drive in 2017 will pursue more Ordinary Members to join the Association. The Malaysia Retail Chain Association (MRCA), Business Network International (BNI) and Branding Association Malaysia (BAM) supply their vast networks and know-how to benefit existing Members, bringing in a combined total of 1,411 relationships. Members furthered their knowledge via the Ad Fraud Forum, entitled Uncovering the Digital Era’s Biggest Con, MAA Marketer Forum with James Sampson, which dealt with programmatic marketing, an introspective on the media supply chain, the meaning of transparency in programmatic and global standards to measure advertisement quality. Innovation Café, meanwhile, discussed key trends shaping shopping, cooking and eating in the next two to three years. Google Ignite, the programme that selects college students for training and internships at nearly 1,100 other companies, is very much in line with one of the Association’s Four Pillars. The Council was more than pleased to extend our support again for this initiative. In similar spirit, the Council also backed the Digital Workshops with the MDA and IAB as a way of developing Members’ talent and is keen to explore comparable programmes in 2017 to advance this agenda. 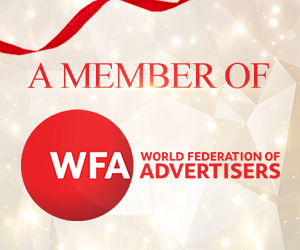 The Association stood tall and proud after Kuala Lumpur became the first South East Asia city to host the World Federation of Advertisers (WFA)’s Global Marketer Conference 2016 last March. The decision to introduce the Affiliate Membership category in 2015 paid off handsomely, as we received very good response from the SMEs, while WFA lured 100 for over 450 delegates for the conference. 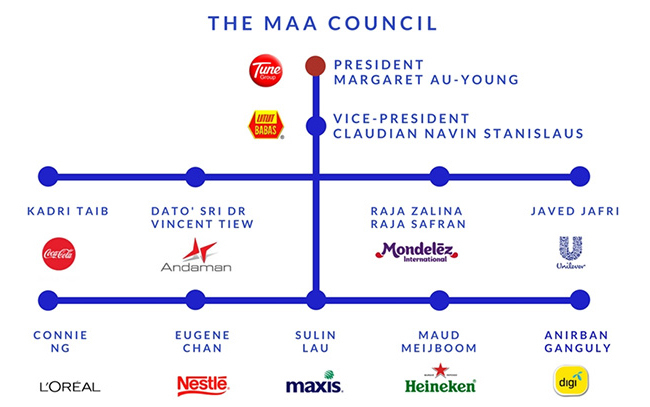 On the home front, the Council maintained association with the Effie Awards, Putra Awards and the MSA’s Media Awards by providing Council members as members of the jury. Likewise, the Council followed the revamp of the Kancil Awards very closely and hope to see a more vibrant and credible event this month. An advisory role to help develop the Ministry of Health’s Third National Plan of Action for Nutrition of Malaysia (NPANM) between 2016 and 2026 is a momentous achievement for the Association. The Association believes in the importance of self-regulation and this role allows Members’ input to be heard and for interests of all industry stakeholders to be preserved and enhanced. On the subject of halal advertising, the Council relayed its view during the International Seminar on Islamic Advertising (ISIA), which was organised by the Ministry of Communications and Mulrimedia that a Technical Committee should be set up with the goal of framing guidelines rather than drafting directives. The ASA agreed to be incorporated as a company limited by shares late last year in a move to increase its clout and legal standing and is working closely with CMCF to review and update the Content Code and the Code of Advertising Practice. While the advertisers abide by the CMCF Content Code in producing their advertisements, the requirements Code are sidestepped by the Censorship Board (Lembaga Penapisan Film or LPF), which employs their own rules to approve advertisements. The Council is currently seeking explanations from the CMCF and an audience with the LPF to stress that any decisions to reject or release advertisements must be founded on established rules and not interpretations. Peer bodies as well as media organisations have approached the Council to collaborate on a few programmes that are designed to assist Members. These include the Digital and Transparency Conference; Leadership Programme for Members in senior management and Partnership for education courses for entrepreneurs. As always, the Council will weigh each proposal and its benefits for Members before proceeding to commit to the programmes. I thank my Council Members, whose diligence and dedication to the numerous activities and projects ensured their success. I’m also indebted to you, our Members, for backing our initiatives and activities. I urge you to spread your support again for the Council’s projects in the coming months for all of us to gain from them.